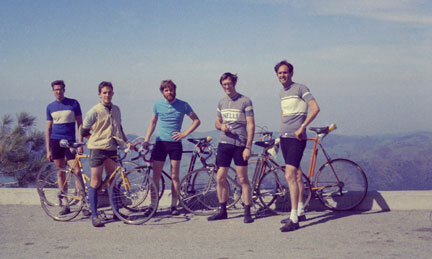 This photo is the oldest I can find of cyclists on Mt. Hamilton. I hope someone out there can direct me to much older photos for my upcoming “Mt. Hamilton by Bike” magazine. I’ve tried all the obvious sources and came up empty. Cyclists have probably been riding up Mt. Hamilton since the 1920s, or even earlier. If you have a solid lead, let me know. Even an account or a remembrance would be nice. The oldest account I have is 1955. This entry was posted on January 14, 2011 at 6:03 pm and is filed under History. You can follow any responses to this entry through the RSS 2.0 feed. You can leave a response, or trackback from your own site.